Dr. Scott Berken is a 1977 graduate of Aberdeen’s Weatherwax High School. He pursued his Bachelor of Science Degree at University of Puget Sound and later, Pacific University. He then continued his professional training and received his Doctor of Optometry Degree at Pacific University in 1985. 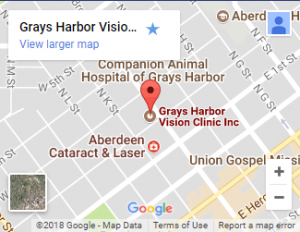 Scott has been practicing optometry at Grays Harbor Vision Clinic since 1985. He is an active member of the Optometric Physicians of Washington, and he is a member of the American Optometric Association. He has served as President of the Olympic Society for the OPW. In 2009, Scott volunteered vision care for the AOA/ VOSH Mission to Honduras, South America, where free eye exams and glasses were provided to hundreds of Hondurans in need. Locally, Scott is an active member and past- president of the Aberdeen Lions Club, and is involved with the Lion’s Sight Committee. He is also the recipient of the Melvin Jones award for service to Lions Club. Other community involvement includes past leadership at the Grays Harbor Chamber of Commerce, the Grays Harbor YMCA, and chairmanship of the Aberdeen High School Boosters club. Dr. Berken’s avocations include sailing, snow skiing and traveling with his wife Lori. Together, they have two grown sons, Jared and Caleb. Scott enjoys seeing all the different people in the office and providing the appropriate eye care for their visual needs. His objective is to educate patients on their visual conditions and present the best options for their care.